A total of 7 Stanford golfers are competing in events at the same time. David Chung won all four of his matches in the Palmer Cup leading the US team to victory or European collegians in Royal Portrush Golf Club in Northern Ireland while 6 Cardinal golfers led by a win by recent grad Joseph Bramlett competed in the Northeastern Amateur in Rhode Island. Here you will find complete scoring for the Northeastern Amateur. Bramlett won by 2 shots rounds of 69-68-66-67. Sihwan Kim (68-67-70-70) and Andrew Yun (69-69-71-66) tied for 4th. Steve Ziegler tied for 7th with 66-70-70-70 rounds. Grad Dodge Kemmer (69-68-72-69) tied for 11th and incoming freshman Cameron Wilson (68-73-70-71) tied for 18th. The Palmer Cup was played at Royal Portrush GC in Northern Ireland between European and American collegiate golfers. All the results can be found at http://www.palmercup.org/. PORTRUSH – The United States defeated Europe, 13-11, to claim the Palmer Cup held at Royal Portrush Golf Club. The victory was the Americans first in Europe since 2002 and gives the USA a 7-6-1 overall advantage in the Palmer Cup series. Each side claimed four matches in final day singles action. Daniel Miernicki and David Chung posted the first two victories of the day for the Americans when they defeated James Byrne and Henrik Norlander, respectively. Miernicki claimed the first hole in his 5 and 3 win and never trailed. Chung holed in from the fairway for eagle on the first hole of his match but Norlander would respond with an eagle of his own at the par 5 second. Chung would reclaim the lead after No. 4 before cruising to a 4 and 2 victory. Chung was the only player to post a 4-0 record at this year’s Palmer Cup. It was just the 12th unbeaten and undefeated performance in the 14-year history of the Palmer Cup. Prior Round Story: PORTRUSH, Norhern Ireland - Stanford junior David Chung won both of his matches on Thursday to help the United States to a 6-2 lead over Europe after the first day of the Palmer Cup being contested at Royal Portrush Golf Club in Northern Ireland. Chung partnered with Jonathan Randolph to defeat David Lingmerth and Patrick Spraggs, 1-up in the four-ball matche and defeated the same European pair in the afternoon foursome match. Chung and Randolph won the first hole with birdie and led throughout. The two teams halved the next two holes before the U.S. won No. 4 by concession and the fifth and sixth with birdie to move to 4-up. Chung and Randolph moved the lead to five after eight holes. Europe would trim the lead to 3-down after No. 11, but the Americans won Nos. 13 and 14 to close out the match. "They did great," said United States Head Coach Chris Zambri. "As it turns out we lost the first two matches of the event and we've won since then. I'm proud of my guys. I'm proud of Jonathan (Randolph) and David (Chung) for winning two matches and winning convincingly. I'm also proud of the guys who had close matches that could have gone either way and luckily for us they went our way. That's the real sign of a champion, to win a close match. Their whole lives they will be playing in close matches and they'll have to play important rounds and it's great to see them step up when they need to." Chung will face Europe's Rhys Enochs in Friday's singles competition. Friday's round will consist of singles matches and begin at 10 a.m. Recent grad and captain Joseph Bramlett missed the US Open cut by 5 shots with rounds of 79-75 at Pebble Beach. He tied for 5th among the 12 amateurs in the field. His first round included a 4-over 8 on the 13th hole while his 2nd round was highlighted by a birdie on 10 broadcast live on the national telecast. Overall Joseph hit only 13 greens (36%), hit 17 fairways (61%) and was 3 of 8 in sand saves. He had 59 putts. Joseph plans to compete as an amateur over the summer and turn pro in the fall at the PGA Tour's qualifying school. Click on the image below to see Joseph's stats along with other amateur scores. By David Shefter and Dave Shedloski for the USGA. Pebble Beach, Calif. - A lot of good things generally come with a Stanford University degree. A starting time at Pebble Beach during U.S. Open week, however, isn't generally a benefit of the diploma. Unless your name is Joseph Bramlett. The 22-year-old graduated on Sunday and was playing a practice round with fellow Cardinal Tiger Woods on Tuesday morning in preparation for the 2010 U.S. Open. Now that's a graduation present. "It was awesome," said Bramlett of his pairing with the world's top-ranked golfer. "I got to learn a lot from him and his caddie, Stevie. It was an exciting day." Not long after Bramlett qualified on June 7 in Sacramento, Stanford coach Conrad Ray, a former teammate of Woods in Palo Alto, e-mailed Tiger to let him know that Bramlett had made the field. Arrangements were quickly made for a practice round. It wasn't Bramlett's first encounter with Woods. He and his Stanford mates had been guests at Tiger's Isleworth home three times during a college tournament that is annually held in the private Windermere, Fla., community. Woods also visited Stanford last fall prior to the Presidents Cup at Harding Park in San Francisco. "I've gotten to know him over the years," said Bramlett. It also seemed appropriate that Pebble Beach is the host course for Bramlett's first U.S. Open. Five years ago, he aced the par-3 fifth hole during a semifinal match at the California Amateur. He lost in the final the next day to Don Dubois. In 2006, he was a semifinalist at the California Amateur. "He's got good karma here," said Ray. 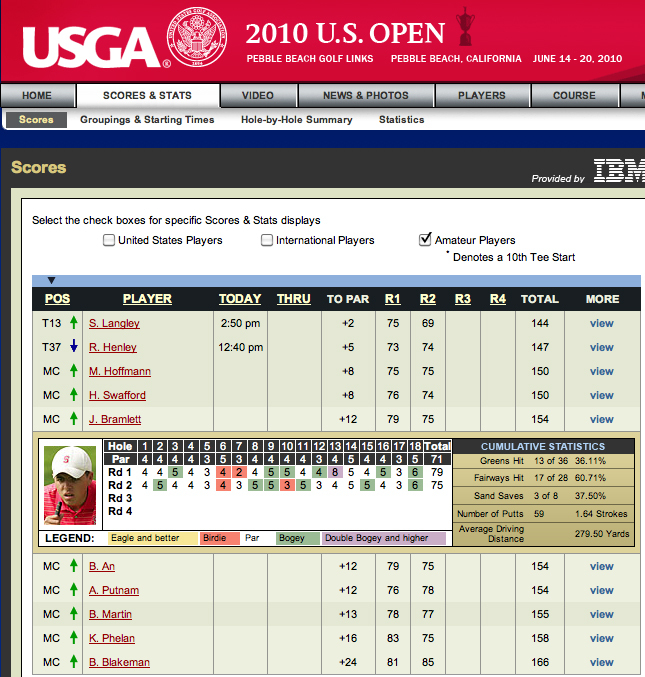 And Bramlett says he's completely healthy entering the Open. Over the past two years, his collegiate career was interrupted for two separate right-wrist injuries, the first suffered in January of 2008 when he slipped while running wind sprints and the second 11 months later when he was biking to a Stanford classroom to turn in a final exam. He flipped over the handlebars and was sidelined until January of 2010. "Two fluke accidents," said Bramlett, a five-time U.S. Amateur qualifier, including 2002 at Oakland Hills when he was the youngest qualifier in the championship's history at age 14. "I missed three half-seasons." All of which makes his U.S. Open entry that much more special. A Northern California native from Saratoga, Bramlett came to the 2000 Open at Pebble to watch Friday's second round with his parents. Only 12 at the time, Bramlett knew that someday he wanted to be inside those ropes. "And now I am finally getting the chance," said Bramlett, who plans to remain an amateur until PGA Tour Qualifying School this fall. "It's really come full circle for me." Bramlett said there have been plenty of requests for tickets from friends and family. Fortunately, he doesn't have to worry about them. "My mom is handling that," he said. "That way I can focus on golf a little bit. There have been quite a few people. A lot of people can get tickets on their own." Bramlett is appreciative of the support, but says his gallery pales in comparison to that of Tiger Woods. "I don't have Tiger fans," he said with a laugh. "There is a lot of local support, which has been great. It's really awesome. People are sending me texts: 'Go Get 'em. Good luck. We're behind you.' It's been a lot of fun." PEBBLE BEACH, CALIF. — Joseph Bramlett was a freshman when he first sat in Tiger Woods' living room with the rest of the Stanford golf team, peppering the world's No. 1 player about everything from the short game to course management. They were together again last October, in the days leading up to the Presidents Cup in San Francisco, when Woods visited his alma mater and got into a putting contest with Bramlett. Nothing could top Tuesday, though. The lesson was familiar — short game and course management. The classroom could not have been more spectacular. Woods and Bramlett stood behind the green on the par-3 fifth hole at Pebble Beach, easing their way through a practice round for the U.S. Open. Woods pointed to various spots on the green to show the kid what to expect. "It's been an amazing week already," Bramlett said quietly. Getting to this stage was not easy. In a sport still lacking in diversity — Woods remains the only player of black heritage on the PGA Tour — there was reason to believe Bramlett could join him one day. He grew up outside San Jose in a multiracial family — his father is black, his mother is white — and endured the odd stares at junior events when his parents followed him along. He plastered posters of Woods on his bedroom wall after Woods won the 1997 Masters, and he later competed in the Junior World Championship in San Diego with a team sponsored by the Tiger Woods Foundation. Bramlett put in the work and was proud of his results. When he was 14, he became the youngest player ever to qualify for the U.S. Amateur in 2002. He was an All-American his freshman year at Stanford, when he helped lead the Cardinal to an NCAA title. Bramlett flew straight home to California to try to qualify for the U.S. Open, losing out in a playoff. Surely, there would be other chances. The first setback came in the middle of his sophomore year when Bramlett slipped on a wet mat in the weight room and injured his right wrist. It turned out to be a bone bruise, but it kept him from competing. Just as he was beginning to recover — he twice shot 60 in the fall of his junior year — Bramlett was riding his bike when he took a spill over the handle bars, braced for the fall with his hands and injured ligaments and tendons in the same wrist. "The second one hurt," Bramlett said, speaking more of the emotional damage than the injury itself. "As soon as it happened, I had a sick feeling in my stomach. I went 13 months not knowing what was wrong and how to fix it. I just had to wait. Surgery wasn't going to help. It was a little bit frustrating, but it was over and you move on." Walking along with Bramlett on Tuesday were his father, Marlo, and Stanford golf coach Conrad Ray, who could appreciate the experience. 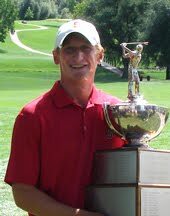 Ray, who played for the Cardinal on the same team as Woods, qualified for his only U.S. Open in 2005 at Pinehurst No. 2, and spent a practice round with Woods. It was hard to determine who was more proud. Marlo Bramlett still remembers the day his son beat him for the first time, at age 12. They were tied at San Jose Country Club when the kid got up-and-down from a bunker by holing a 6-foot putt, turned to point at his father with a wide smile and said, "I got you." "I've never been more proud as a parent, and I've never been more mad as a parent," the father said with a laugh. "I put my clubs away and went to the office to cool off. And I realized, 'You're not going to beat him much more.'" Marlo Bramlett figures the injuries that slowed his son only made him stronger. To see him at Pebble Beach was proof. "It means a lot to see him achieve this because he worked so hard at it," the father said. Ray arranged the practice round with Woods, sending him a text not long after Bramlett qualified. Woods remembered him well and replied immediately. "It's great to see him healthy again," Woods said. "He's been struggling with a bad wrist for the last couple of years, and to see him out there and not flinching, not in pain — he's such a great kid — it's good to see." What impressed Ray the most was how Bramlett insisted on being part of the Cardinal team even when he wasn't healthy enough to play. His teammates voted him captain for his senior year, and while Bramlett struggled at times, he came through in the clutch. Stanford, Arizona State and San Diego were in a playoff at the NCAAs for the final spot in the match play portion of the tournament. San Diego had finished its playoff holes in 2 under. Stanford avoided elimination when Bramlett made a 25-foot birdie putt, and it advanced to the final round on the next hole. "It was a reasonably big fist pump," he said. Bramlett was just getting started. He flew back to California after the NCAAs and shot 65-71 at Del Paso in Sacramento to make it by one shot into his first U.S. Open. He might have expected to be here sooner. Then again, he never expected to miss parts of two years with injuries that could have ended all his dreams. "It helped me grow as a person and understand that it's not always going to go your way," he said. "It's not always going to be easy and it's not always going to be fair. But you work through it. You take what you get and make the most of it." Two days before his practice round with Woods, he graduated from Stanford. The US team finished in 2nd place behind Japan in the US Junior World Cup played in Japan. Incoming freshman Cameron Wilson finished tied for 16th individually after rounds of 66-72-73-71. Here are post tournament results. Here is the official tournament website. TOYOTA CITY, Japan – The United States finished second at the TOYOTA Junior Golf World Cup 2010 supported by JAL at Chukyo Golf Club’s Ishino Course. Yarik Merkulov tied for fourth individually at 8-under. Japan won the team title while Yosuke Asaji of Japan, Canada’s Corey Conners and Denmark’s Lucas Bjerregaard tied for medalist honors at 10-under 274. Team USA entered the round in second place, six shots behind Japan. The Americans struggled out of the gate, but rallied to play the front nine at 3-over. Strong performances by Canada, Denmark and Thailand allowed them to pass the United States late in the round. However, two late birdies by Oliver Schniederjans and a pair of eagles by Cameron Wilson allowed the U.S. to move into a four-way tie at 15-under with Merkulov on 18 putting for birdie. Merkulov was 2-under - and in middle of a bogey-free round - when sizing up his downhill 15-footer. His ball was at the back of the green with a right-to-left break. Merkulov committed to a line and started his putt cup right of the hole. His putt went in dead center to move back to 3-under individually and the United States 16-under as a team and back in sole possession of second place. TOYOTA CITY, Japan – The United States fired 11-under 202 to stand atop the leader board following the opening round of the TOYOTA Junior Golf World Cup 2010 supported by JAL at Chukyo Golf Club’s Ishino Course. Team USA’s Cameron Wilson leads individually after posting 5-under 66. The United States got off to a slow start, but made the turn with Bobby Wyatt sitting at 3-under and Yarik Merkulov at 1-under. The Americans heated up on the back nine with all four players shooting under par on the back and for the round. Wilson - who recovered from a 2-over after four holes start - posted 31 on the back nine - including a stretch of eagle-birdie-birdie on Nos. 15-17 - to move from even par to 5-under. Wyatt missed a short par putt on No. 18 to fall to a tie for second overall at 4-under 67. Yaruslav Merkulov sits in a seven-way tie for tenth at 2-under 69 while Oliver Schniederjans shot 70. After his slow start Wilson moved back to even after birdies on the sixth and eighth holes. Four pars would follow a birdie at No. 10 before his strong finish. STANFORD, Calif. - The Knowles Family Director of Men's Golf, Conrad Ray, announced the team's year-end awards today. The annual awards honored five separate members of the 2009-2010 squad and were voted on by the team and coaching staff. Freshman Andrew Yun received the Steele Award for the freshman with the lowest stroke average. Yun managed a 72.2 average over 39 rounds and played every event in the top 5 for the Cardinal except one. Freshmen Steven Kearney was awarded the team's Most Improved Player award. Kearney competed in four tournaments for the Cardinal this year with a final round 70 at the Gifford Collegiate at CordeValle to help the team win it's first team trophy of the season. 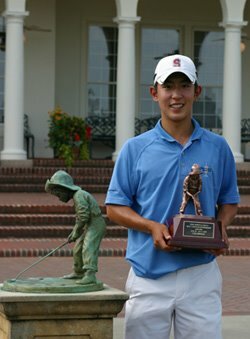 Sophomore David Chung, who was selected to be of the 2010 Palmer Cup Team by the Golf Coaches Association of America (GCAA), was voted the team's Most Valuable Player. In addition Chung was also first-team All Pac-10 in one of the strongest year's for the conference in history. The Stanford Tradition award, an award given to the player exhibiting leadership, strong work ethic, academic excellence, and an overall appreciation of the traditions of the University and Stanford Men's Golf, was given to senior captain Joseph Bramlett. Bramlett also recently qualified for the 2010 US Open at Pebble Beach. Finally, Stanford Golf's highest award, "The Spooney", which is given to the team member with the most tenacity and never give up attitude, was awarded to Sophomore Steve Ziegler. "Our program is very proud of these team members and we are looking to build on this leadership in the upcoming years." said Head Coach Conrad Ray. Senior captain Joseph Bramlett is headed to the beach (Pebble Beach that is) after graduation after qualifying for the US Open yesterday with rounds of 65-71 playing at Del Paso CC in Sacramento. Joseph had a quick turnaround from Stanford's competition at the NCAA Championship in Chattanooga, Tennessee where the Cardinal finished tied for 5th. The Sacramento Bee reports: Bramlett, 22, a Saratoga resident, gave himself a whopper of a college graduation present with rounds of 65 and 71. He will graduate from Stanford on Sunday. Bramlett ... birdied his final hole to avoid a playoff, sinking an 8-foot putt he assumed would be relevant. "I hit some loose shots in the afternoon," he said, "but I bounced back every time. And I made a putt that I pretty much knew I had to have." Bramlett majored in communications. How does he plan to utilize his degree? "To play pro golf," he said. The US Open will be played at Pebble Beach June 14-20 and it will be a return to a very familiar course for Bramlett who hails from nearby Saratoga, California. In 2005 Joseph was a finalist at the California State Amateur Championship played at Pebble Beach and he has played there many other times. Joseph was the youngest qualifier for the US Amateur at age 14 and he had a brilliant career as a junior golfer. For one of the most highly recruited golfers to come into Stanford, the last two years have been difficult ones due to a wrist injury. After playing a major role as a freshman in Stanford NCAA Championship in 2007, Bramlett was named a 2nd team All-American. His wrist injuries cut short his next two seasons and affected his senior season until the spring. Here are complete results from Joseph's Sectional Qualifying site. At the NCGA site you'll find the photo above and this story of the Sacramento qualifying results. 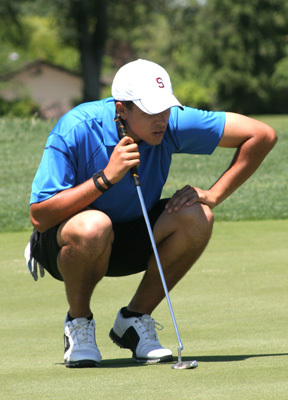 Other Stanford golfers who competed in sectional qualifiers and failed to advance were All-American sophomore David Chung, 17-year old incoming freshman Cameron Wilson, and alums Joel Kribel and Jim Seki. 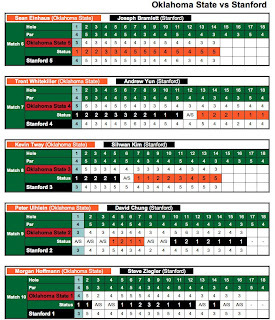 Playoff and Match Play Results --- It was a day of high drama for the Cardinal team as they first were in a 3-team sudden-death playoff against ASU and San Diego trying to qualify as one of the 8 teams in the match play portion of the national championship. On the first playoff hole Stanford and San Diego both were 2-under par as ASU was eliminated. On the 2nd playoff hole, four Stanford players made key putts led by Sihwan Kim's 15 footer for birdie as the team was 1-under vs San Diego's even par hole. Key par putts were made by David Chung, Andrew Yun and Joseph Bramlett for the win. In the first round of match play the Cardinal was up against the #1 seed Oklahoma State. The match went back and forth with the clinching contest being Andrew Yun unable to pull out his match on the 18th hole after Joseph Bramlett and Sihwan Kim both lost. After going 2-up early, Sihwan saw his opponent, Kevin Tway birdied 6 of his next 9 holes and finish 6-under. Hats off to OSU's players who played very strong golf. Sophomore All-American David Chung was 4-under at the turn but was even with fellow first team All-American Peter Uihlein but David ended up winning the match 1-up. To see the complete match play results click on the image below. Congrats on another great season despite the disappointing finish. After the 3 rounds of stroke play --- Stanford will play off early Friday morning for the final qualifying spot with ASU and San Diego as each team ended with a total score of 4-over par 868. The third round was a cliff-hanger for 8 teams in contention for the 8th, competing for the last spot to move into the match play portion of the national championship. 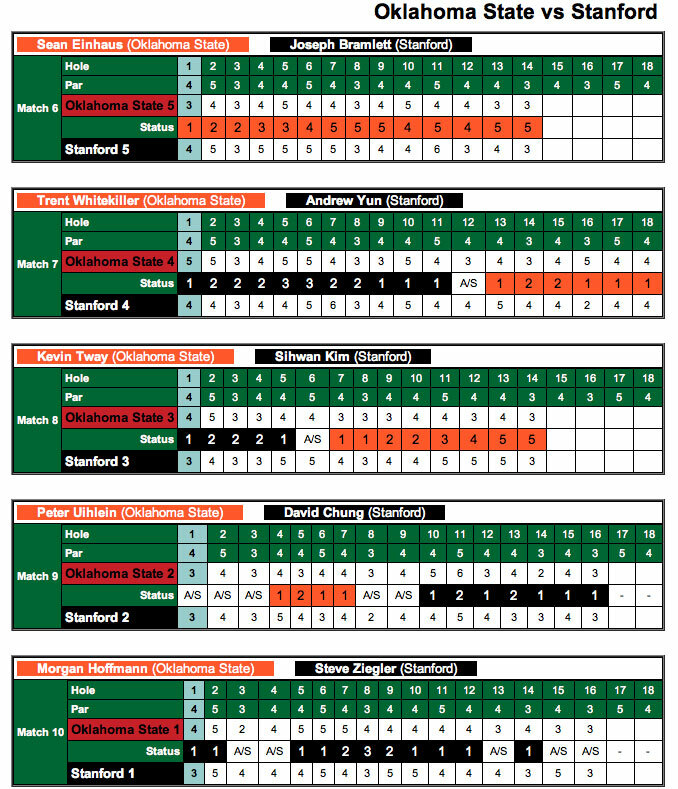 Oklahoma State wrapped up the day as the top team advancing to quarterfinals match play, finishing at 14-under 850 after shooting 5 under on Thursday. Also qualifying for match play were Florida State (854), Georgia Tech (858), Washington (860), Oregon (861), Augusta State (863) and Texas Tech (867). After two of the three rounds of stroke play Stanford is tied for 11th, 3 shots off the "cut" line for the low eight teams that would move into the match play portion of the national championship. 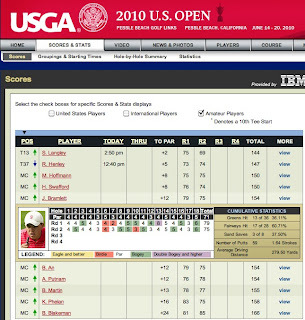 Here you will find Live Scoring including individual scorecards and full scoring details. The Cardinal tees off starting at 11 am PST playing with ASU and Virginia in what will be a pressurized battle against a very tough course. Five teams including Stanford are within 3 shots of the cut-line. Of the top eight 5 of those teams are separated by only two shots. Stanford's talented and well-balanced squad appears to be ready to make a strong final round run at the leaders. "We have finished up two rounds here in the NCAA Championship at the Honors Course in Chattanooga, TN. The guys have fought hard over the last few days and are very close to the magic number ... the top eight teams that qualify for match play. We haven't had our best round yet and I believe it will come tomorrow. We need to hit the ball in the fairway a few more times off the tee and we will be in good shape. Big numbers have also been our nemesis so far and our goal is to eliminate the "others". The course is very demanding so I am sure the scores will rise with the tension of the last day of stroke play. I am sure the greens will continue to firm up as well. The Cardinal is seeded second in the 30-team field behind Oregon. Oklahoma State is seeded third, followed by Washington and Texas. Rounding out the field are teams from (in order of seeding) Texas Tech, Texas A&M, USC, Augusta State, Florida State, Clemson, UCLA, Florida, Georgia Tech, UNLV, Kent State, TCU, San Diego, California, Arizona State, Oregon State, North Florida, Duke, Tennessee, Penn State, Virginia, Illinois, LSU, Baylor and Georgia Southern. Teams will play 54 holes of stroke play over three days with the top eight teams advancing to the single-elimination, match play format that will be used to determine the national champion. Stanford is expected to enter a lineup made up of senior Joseph Bramlett, juniors Steve Ziegler and Sihwan Kim, sophomore David Chung and freshman Andrew Yun. Bramlett played a key role on the 2007 NCAA title-winning team as a freshman, turning in rounds of 68, 70 and 69 after an opening round 78, as Stanford claimed its eighth national championship in Williamsburg, Va. The Cardinal is hoping to ride the momentum from its first place finish at the NCAA Central Regional into Chattanooga. "Our team is confident and everyone is playing well," said Knowles Family Director of Golf and head coach Conrad Ray. "Every event presents new challenges and we know we'll have to work hard to win the championship. "We are close to clicking on all cylinders," Ray said. "We have prepared well so now the biggest task is not to over think and just go out and play golf." This marks the second year the NCAA Championship has been decided in a match play format. 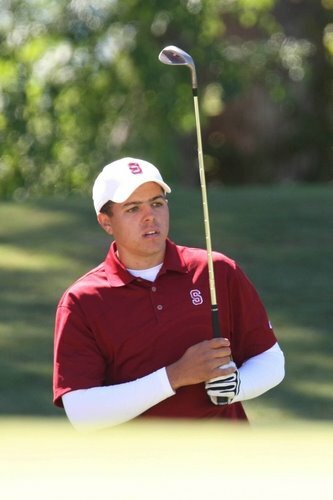 Last season, Stanford failed to qualify for the match play portion of the event after finishing 20th in stroke play. In March, Stanford fell in the second round of the Callaway Collegiate Match Play Championships in Marana, Ariz.
Ray doesn't differentiate between the keys of success in stroke play, compared to match play. "You have to hit quality shots and stick to your game plan, regardless of what format you're playing. You want to force your opponent to bet you, instead of the other way around. "It will be exciting is we are lucky enough to make the top eight. Anything can happen." The last time the NCAA Championships were held at the Honors Course was in 1996. 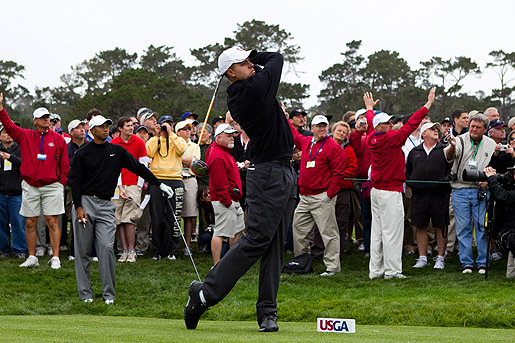 Stanford finished fourth while Tiger Woods claimed the individual title a three-under score of 285. "The Honors Course is a championship test of golf," said Ray. "It was very high rough and challenging greens. We can't wait to get there." Stanford will depart for the NCAA Championships on Saturday and will see the course for the first time on Monday during its practice round. The Cardinal will tee-off from the 10th tee of the Honors Course on Tuesday at 12:12 p.m. and 7:00 a.m. from hole No. 1 on Wednesday. Stanford will be paired with Oregon and Oklahoma State over the first two rounds before the teams are repaired for the final 18 holes on Thursday. The top eight teams will advance to the championship match play, which will get underway on Friday. Seedings will be determined by the order of finish in the stroke play competition. Stanford is seeking its ninth national title, having last won the NCAA Championships in 2007 in Williamsburg, Va.